Phoebe Plumm and Micah Tanner are no longer the spoiled heiress and naïve servant boy who first stumbled upon the fiercely beautiful world of living metal known as Mehk. They have rallied to aid the mehkans and risked their lives fighting the relentless greed of the Foundry, a corporation that harvests the metal creatures to sell as products back home in Meridian. But the kids' mission to retrieve a mysterious relic ended in devastating tragedy and with Micah as a prisoner of the enemy. Shattered, he can only watch as an unthinkable new power rises in Mehk and international war erupts in Meridian. Trapped between the Foundry and this staggering mehkan threat, Micah has no choice but to work with dangerous humans and mehkans alike, each with their own agenda. As the path of destruction spreads and hope fades, Micah leads his unlikely allies in a desperate race back to Meridian, where the two worlds are about to clash. A terrible reckoning is underway, and this time, everything is at stake. 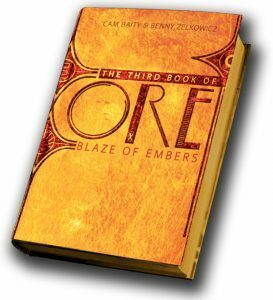 Missed The Foundry's Edge (The First Book Of Ore) or Waybound (The Second Book of Ore)? Found out more at http://www.booksofore.com. The cords tying Micah to the back of the Cyclewynder were pulled so tight that his legs were numb, and the digital manacles biting into his bruised wrists felt icy in his lap. Goodwin wasn’t taking any chances this time, but it didn’t matter one bit. Micah had nowhere to run. And no will to try. His freckled face felt frostbitten, and he shivered uncontrollably. Though the Foundry workers had draped Micah in a foil thermal blanket, he was frozen from head to toes—especially toes. His boots were gone, and all he had on were his greasecovered overalls and dingy T-shirt. Sharp wheels carved the rough ground of the Coiling Furrows, their grating sound echoing off the curved walls of the impossible maze. Facing backward, Micah counted four Cyclewynders behind him, but he knew there were twice that many up ahead. The headlights of the Foundry convoy cut harsh beams through the gloom and threw twisty shadows everywhere. Flaring light revealed a limp form strapped to one of the Cyclewynders. He caught a glimpse of her dark, uneven hair fluttering in the wind. Micah had to look away. They were taking him in now to be questioned. Goodwin would ask about the Covenant and the Ona, ask what he and Phoebe were doing to help the mehkans. Micah wouldn’t say anything, no matter what they did to him. They couldn’t make him hurt more than this. Which meant the Occulyth would be safe. Micah hadn’t seen it anywhere in that chamber. Maybe—just maybe— Phoebe had managed to get it to the Ona. That was all that mattered. He told himself that, again and again. Whatever happened to him and Phoebe, saving Mehk was the most important thing. He desperately wanted to believe that. But he didn’t, not really. Micah couldn’t guess how long they had been puttering through these stupid passages. Star-streaked sky peeked in through irregular openings above. Those interconnected, vibrating stars had been the first thing Phoebe noticed when they stumbled into Mehk, the first sign that they were in a world stranger than anything they had ever imagined. Now those same stars danced on, oblivious to the life that had ended here below. At last, the Foundry convoy emerged from the Furrows and arrived at a bleak camp of pentagonal tents at the foot of a monstrous mountain range. Obscuring the peaks was the Shroud, a wall of fog that stretched up and out as far as the eye could see. Harsh floodlights and humming generators were huddled around a pair of Gyrojets, sleek multi-winged aircraft like raptors waiting for prey. The team of Cyclewynders parked alongside the tents. A couple of soldiers untied Micah from the vehicle and roughly dragged him to Goodwin, his toes barely scraping the ground. The Chairman looked like he had something to say. If this were an episode of Maddox, Micah’s favorite Televiewer show once upon a time, the hero would have a clever zinger ready to deploy. Or he would spit in the villain’s face before wiping out all the bad guys single-handedly. But Micah was not Maddox. He was just a boy—a helpless, broken boy, and weary beyond belief. So Micah did nothing. Excerpted from BLAZE OF EMBERS © Copyright 2017 by Cam Baity and Benny Zelkowicz. Reprinted with permission. All rights reserved.